One can’t knock around the space world for long without bumping into the Overview Effect. Its ubiquity is a sign of Frank White’s success in putting a name to that feeling an astronaut gets when peering out from an orbiting spacecraft at a borderless blue-green world below. But despite having watched Fragile Oasis and Planetary Collective’s short film Overview, and tracking with interest the ongoing discussion of whether suborbital tourism will make the world a better place, I had not read the book that started it all until the release of the much-updated third edition in late 2014. 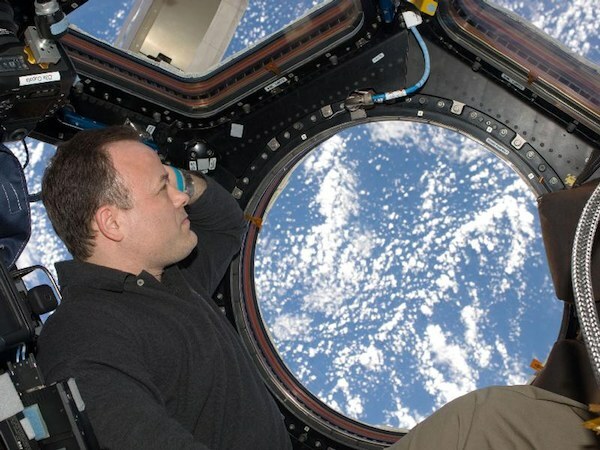 NASA astronaut Ron Garan gazes at Earth from the International Space Station. (Credits: NASA). The Overview Effect is a cognitive shift in awareness reported by some astronauts and cosmonauts during spaceflight, often while viewing the Earth from orbit, in transit between the Earth and the moon, or from the lunar surface. It refers to the experience of seeing firsthand the reality that the Earth is in space, a tiny, fragile ball of life, ‘hanging in the void,’ shielded and nourished by a paper-thin atmosphere. The experience often transforms astronauts’ perspective of the planet and humanity’s place in the universe. Some common aspects of it are a feeling of awe for the planet, a profound understanding of the interconnection of all life, and a renewed sense of responsibility for taking care of the environment. Reading this book I was surprised by the complete lack of photographs. In trying to communicate the awe experienced in Earth-gazing from space, video and photography have played a huge role in extending the reach of space to a distracted, Facebook-saturated public. White makes reference to the power of multimedia, but does not invoke it himself. Perhaps the omission was simply due to the cost of printing color plates – but it leaves a wordy work a bit less inspired. Is Overview Effect a Philosophy or Just a Feeling? White’s success in popularizing the term overview effect has not extended to the bevy of other terms defined in this work: universal insight, Copernican perspective, planetary management, Gaia hypothesis, terranauts, overview system, technos, technosystem, cosma hypothesis, terra, solarius, galaxia, homo spaciens. Perhaps one day White will be proven prescient and these terms will come into their own as useful forms to communicate abstract concepts. In the here and now, I found increasingly irksome the frequent gray-boxed definitions, as the terms didn’t seem of much use once they were defined – they were just there. The further into the book I read, the more dismayed I became at White’s not-particularly-subtle insertions of spiritualism and grandiloquent unsubstantiated claims of new forms of civilization derived from overview effect’s aftermath. White did us all a service by putting a name to that feeling many spacefarers felt and could not communicate, but he seems to have been stumped by the challenge of making that feeling seem real in the ongoing humdrum of modern life on Earth. While the philosophy of overview effect never materialized for this reader, White’s work justifies itself in my view with more than 100 pages of interview transcripts and excerpts collected over almost 30 years including conversations with astronauts, cosmonauts, and New Space entrepreneurs. He has included quotes collected from other works to incorporate reactions from the early Vostok and Mercury pioneers, but his own interviews are more extensive, starting with an 1985 conversation with Gene Cernan (“Being a quarter million miles out in space has to give you a different perspective. Anyone who denies it has missed something.”) and ending with the Virgin Galactic executives and not-yet astronauts Richard Branson, and George Whitesides and his wife Loretta, founding members of the Overview Group still questing for their own first glimpse from above. At the end of the day, The Overview Effect was a good start at nailing down the psychological and sociological effects of spaceflight that once existed only on the periphery of space exploration science and mission objectives. That such effects are now themselves subject of mainstream scientific study must be attributed at least in part to White’s original work in forging the overview effect. But in a day when eye-popping time lapse videos of Earth as seen from space are set to lush musical overtures and spread virally over the face of the world wide web, perhaps a third edition of The Overview Effect is beside the point. The Overview Effect: Space Exploration and Human Evolution, Third Edition by Frank White published by the American Institute of Aeronautics and Astronautics, Inc. is available online or at a bookseller near you. How did reading The Overview Effect affect you? Share your experience in the comments section below!